I realize I’m a wee bit tardy on this post, but you know – there has been sunshine to enjoy, ornaments to write, and lyrics to memorize! But I didn’t want to let too much more time pass before sharing the amazing evening that I participated in a few weeks back. 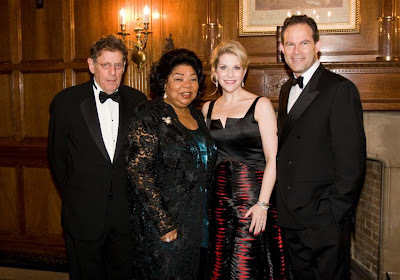 But this year it was my turn, along with Gerald Finley, Philip Glass, Martina Arroyo and Shirley Verrett. Sadly, the effervescent, elegant, refined and awe-inspiring Shirley Verrett could not attend the awards. She was sorely missed and celebrated with gusto by everyone in attendance in her absence. The video clip of her singing Dalilah was ravishing beyond words, and her legacy was deeply felt and celebrated by us all. Gerald Finley, dashing as ever (and with whom I’ve had the privilege of sharing the stage on several memorable occasions), spoke eloquently of the importance of our art form and those who make it possible; following a witty introduction by none other than Paul Simon, Philip Glass accepted his award while speaking of the high calling of composing an opera; and Martina Arroyo – RADIANT with her beaming smile and twinkling eye, inspired all of us who are still singing to be sure to carry the torch, especially bringing in the next generation as we move through our careers. (She’s putting her money where her mouth is, doing marvelous, intensive work with young singers as a part of her foundation. I cannot speak for what the other recipients were feeling as they took their moment in the spotlight, but I can tell you that I was overwhelmed and perhaps even a bit incoherent! The “force of nature” that is Stephanie Blythe served up an introduction to me that reduced me to tears. (Although the tears had no strength to fight themselves back since I was attending the gala with a sleep deficit of about 48 hours!) But I’m rather certain that they would have shown up even with a full night’s sleep, for she was incredibly eloquent and heartfelt and deluged me with the most touching and sincere words I could have imagined. 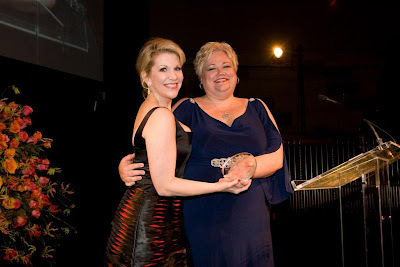 She is a treasure, and I felt quite honored to be receiving this award from her. As I accepted the award, I truly felt the presence of everyone who has touched my life in a significant way: the teachers who inspired with their wisdom and patience, the critics who, oddly enough, also inspired with their dismissals and oversights, the colleagues who challenged me to be better, the friends who lifted me through the most difficult of times, the manager who believed, the family members who walked with me, … and it was each of them that overwhelmed me that evening, knowing that I could not have been standing there with the crystal in my hand without them. We never know the impact we may have on another’s life, but I can say that there have been COUNTLESS people in my life who have taught me, challenged me, lifted me up and tore me down. Yet the reality is that none of them can ever stand on the stage and make me do what I do – no artist or performer has the luxury of leaning on someone when the cue is thrown your way and you’re not sure if you can do it or not. That’s our responsibility alone. But somehow, the strength they have given you along the way, the lessons they have taught you, the times they have abandoned you and forced you to find the strength deep in yourself – somehow they all contribute to the making of an artist, and it was this which was heavy on my mind that night. There is another element to building up an artist and helping them stand on a stage in front of thousands of scrutinizing people: the fans. The wonderful, passionate, discerning and sometimes whacky fans!!! None of this makes sense unless it arrives to the audience for people to hear, experience, live, breathe and FEEL the music and emotion. How privileged I am to be given the honor of singing for you! Oh, there was one more element of the evening – which nearly put me over the edge! My brilliant husband was busy conducting “Casanova’s Homecoming” in Minneapolis the same evening of the awards and was unable to be my date for the night, but the ever thoughtful Met Guild found a way to bring him to NY that night, via a video greeting. As you can see by my reaction, I was taken completely by surprise and felt overwhelmed by the outpouring of love not just from him, but from everyone that evening! Thank you, Dario Acosta for the use of your lovely photos! !